Adam Hinshelwood is hopeful of having Worthing’s injured quintet back to mount a Bostik League Premier Division play-off charge. The club have been blighted by a lengthy injury list for the past few months but several are expected back over the coming weeks. 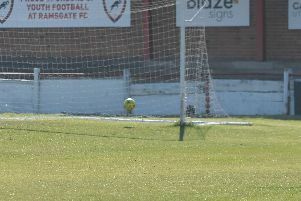 Goalkeeper Lucas Covolan is closing in on a return after breaking his arm against Moneyfields in October, while defender Alfie Young is progressing well following a sustained period on the sidelines. Meanwhile, former Brighton forward David Ajiboye, Danny Barker and defender Joel Colbran are also expected back as Worthing look to sustain a play-off charge in the final run-in. Hinshelwood’s men salvaged a draw at home against Potters Bar Town on Saturday to leave them eighth with 12 games to go. That sees Worthing just two points off a play-off spot and although most injury absentees are not expected back in time for the meeting with Harlow Town at Woodside on Saturday, the boss is upbeat heading into the final stretch. “Lucas (Covolan) is starting to do some diving now,” Hinshelwood said. “Probably not this Saturday but the week after, we could potentially have Lucas, Alfie (Young), Danny (Barker) and David (Ajiboye) back as well. “We’re also hopeful of having Joel (Colbran) back around that time. Worthing confirmed the departure of midfielder Eoin Kirwan after just one appearance earlier this week.